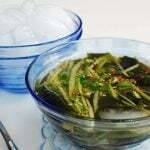 As promised in my mu guk (radish soup) post, here’s my kongnamul guk (soybean sprout soup) recipe. 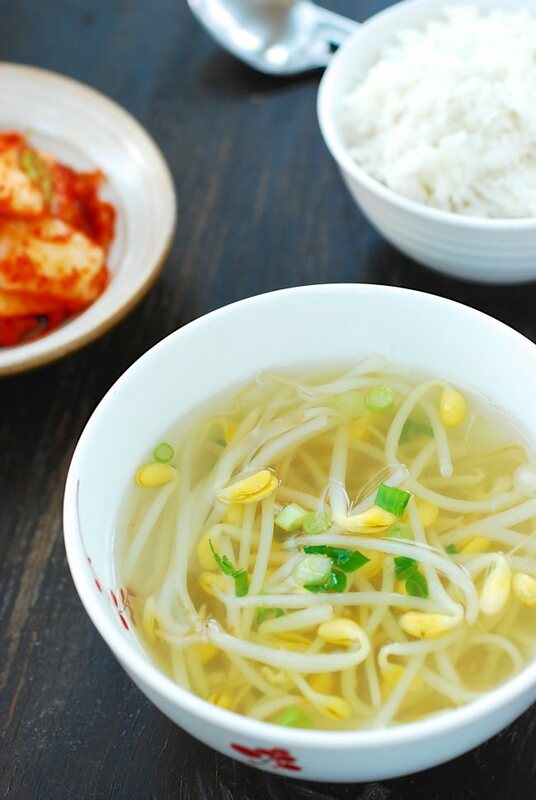 Kongnamul (soybean sprouts) is a staple Korean vegetable that is used in many Korean dishes. It’s cheap and available all year around. 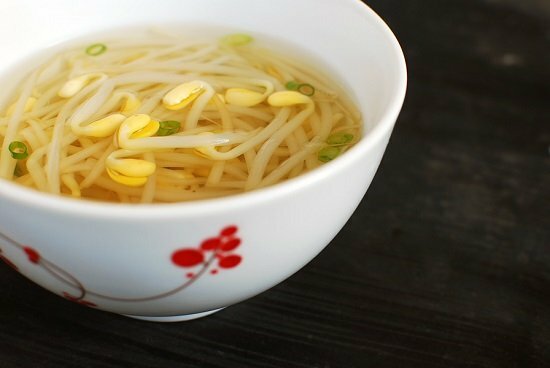 Outside Korea, the best known dish made with soybean sprouts is kongnamul muchim (seasoned side dish), but its soup version is one of the most frequently eaten soups in Korean homes. 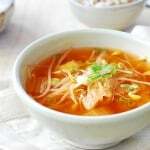 It can be made with any type of broth such as beef broth, anchovy broth, or simply water. 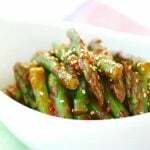 Often some gochugaru (red chili pepper flakes) is added for a spicy kick. 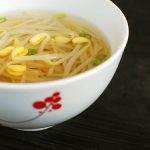 However, unless I make kimchi kongnamul guk, which deserves a post of its own, I usually make it simply with a light anchovy broth to enjoy the natural nutty flavor of the soybean sprouts. Some people snip off the roots for cleaner appearance, but it’s not necessary. I personally don’t think it is worth the time. Plus, the roots have nutrients too. 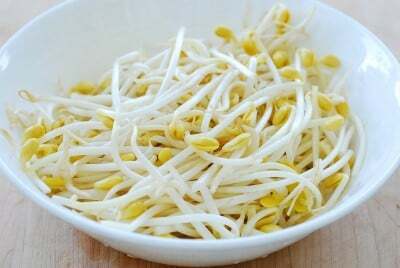 It’s important not to overcook the soybean sprouts to retain its crunchy texture. You can cook kongnamul guk either covered or uncovered. If cooking covered, do not open the lid while the bean sprouts are being cooked, or the raw bean smell will linger even after cooked. 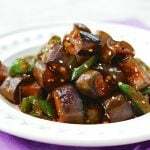 If you have leftover saewujeot (salted shrimp) from making kimchi. Keep it in the freezer. It won’t freeze but will keep well for a long time. Use a little bit to season kongnamul guk. The soup will taste even better. 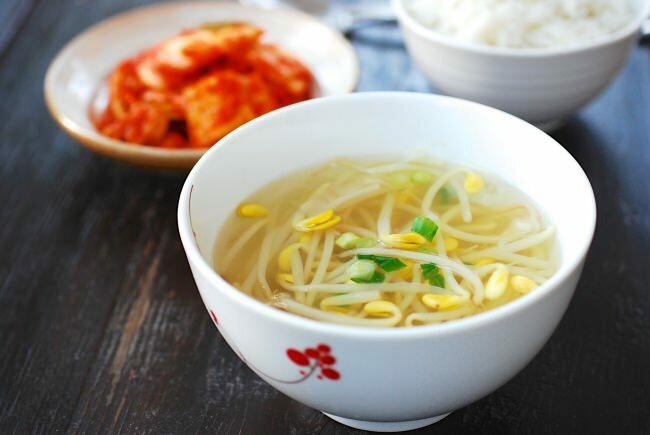 This light and refreshing soup, with a subtle nutty flavor, will go remarkably well with any Korean meal. 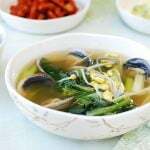 A staple Korean soup made with soybean sprouts! Nice and refreshing! 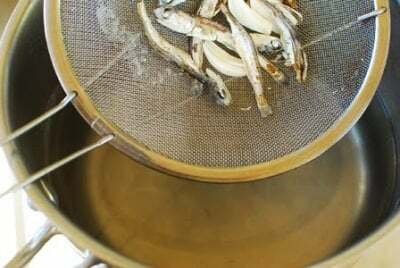 In a medium size pot, bring 6 cups of water with the anchovies and garlic to a boil, uncovered. Reduce the heat to medium high and boil, uncovered, for 10 minutes. Remove the anchovies and garlic from the broth. Rinse the soybean sprouts a couple of times, discarding any skins floating. Add the bean sprouts and 1 teaspoon of salt and boil, covered, Bring it to a boil, and continue to cook for 4 - 5 minutes over medium high heat. 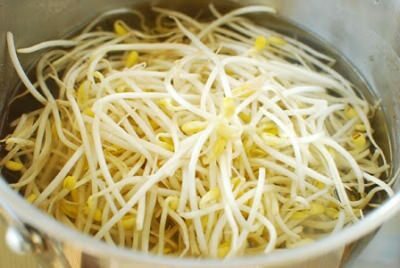 Do not open the lid while the bean sprouts are being cooked, or the raw bean smell will linger even after cooked. Once kongnamul is cooked, taste for salt and pepper. The amount of salt needed at this point will depend on your salt and taste. Add the scallions and serve. Kongnamul guk tastes more refreshing if you season it with salted shrimp (saewujeot) if available. i saw some soybeans sprouts at the local Asian store but did not know how to cook them and did not buy. next time i’ll get some, would love to try this soup. thanks for sharing. This looks like a healthy bowl of soup. I love soybeans sprouts and love all your photos. They are lovely! So looking forward to making this. A gentle and scrumptious bowl of goodness! Roxan – That’s how I eat it sometimes too. Of course you can make this. I really hope you try. Thanks. A little bit of everything – Hope you will buy some next time and try to make this. Thanks for visiting! Quay Po Cooks – Thank you for the nice words. It’s so good to see you again here. Mickle – Let me know how it turns out if you make it. Thanks for stopping by. Mmm. This looks so simple and refreshing! I’ve never made this before. I will have to bookmark your recipe! My mom use Water. How much cups do you think I need or do I still use 6 cups? You can use less if you’re not making anchovy broth, about 4 to 5 cups. Thanks! Happy cooking! sorry i forgt to put that. she doesn’t use anchovy broth. when i watch her. it was always water. but thank you. can’t wait to make this. Hello. Thanks for the great recipes. I was wondering – is it possible to use “da shi da” for the broth? Sure. It would have a different flavor though. Cheers. does anyone know if theres other kind of broth or can i use water by itself? It’s common to just use water for this soup if you choose not to use anchovy broth. Enjoy! I just want to thank you for posting this recipe. My mom came down with an awful cold because of me and I wanted to make her soup to make her feel better. 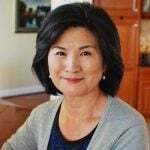 I’m Korean, but never made Korean food before. Your recipe was perfect and the soup turned out great. My mom is loving it. Thanks again. Awww that’s nice to hear! Thanks for letting me know. Not sure where the bitter taste came from. Did you use anchovy broth? If so, perhaps did you remove the guts from dried anchovies? 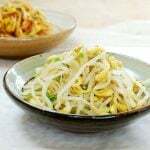 Another thing I can think of is the raw taste of soybean sprouts that linger if you open the lid before the bean sprouts are fully cooked. Hope this helps. Great! I’m glad to be helpful. Happy Korean cooking! If I wanted to add the pepper flakes would I add it before adding the sprouts? 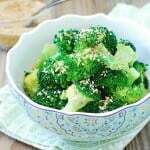 You can add before or after adding the sprouts. Just make sure it has a chance to be boiled in the broth. Sorry for the late reply. I was traveling and couldn’t keep up with emails. Hi! 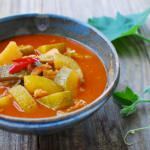 Can I put meat like pork or beef in the soup? Thanks!